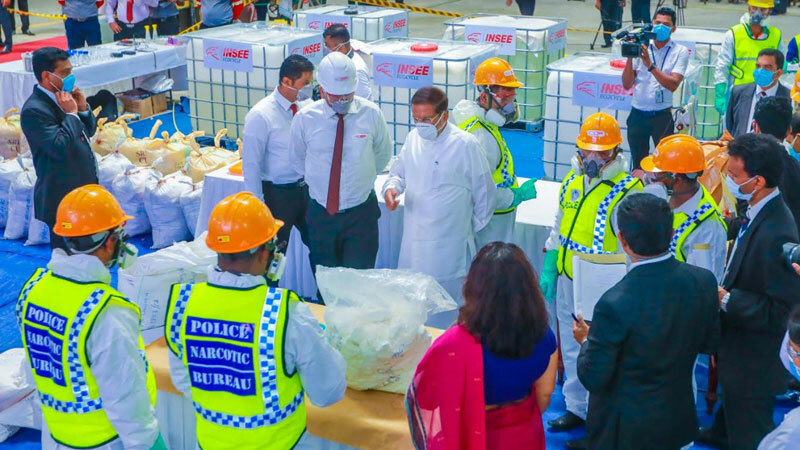 The Government yesterday destroyed 769 kilogrammes of cocaine worth over Rs.10.6 billion which was confiscated in the year 2016, at a warehouse facility in Kelaniya under open court in the presence of both the Colombo and Mt. Lavinia Magistrates. This is the second time, the government has sanctioned the incineration of narcotics in full view of the public. The first instance was in January last year, when INSEE Ecocycle destroyed more than 900 kilogrammes of cocaine in a similar manner. The entire operation was carried out under the strict supervision of Sri Lanka Police, with the patronage of President Maithripala Sirisena who was present at the venue. The cocaine which was diluted yesterday by INSEE Ecocycle at a warehouse facility in Gonawala, Kelaniya were stocks that had completed judicial processes. There were hauls from three court cases before the Colombo Chief Magistrate’s Court, which included the confiscation of 301.235 kg of cocaine from a warehouse in Orugodawatta in July, the seizure of 31.844 kg from Pettiyagoda in Kelaniya in November and the seizure of 219.950 kg by Customs officials from a warehouse in Orugodawatta. Meanwhile, the Mt.Lavinia Magistrate also sanctioned that 216.435 kgs of cocaine be destroyed. This was seized by Police during a raid at a market in Ratmalana in July 2017. The cocaine was verified by the Government Analyst Department, the National Dangerous Drugs Control Board (NDDCB) and Attorney General’s Department prior to it being destroyed. NDDCB Chairman Prof. Saman Abeysingha said that the testing was conducted by the Board which confirmed the feasibility of disposal of specific court samples in the Cement Kiln co-processing at INSEE Ecocycle in Puttalam. “However, the feasibility of destruction of other illicit drugs such as heroin, cannabis and other psychotropic substances including psychoactive substances using the same disposal method is under laboratory investigation at NDDCB,” he said. The confiscated cocaine was liquefied in an aqueous medium at the warehouse facility yesterday. The pre-processing involved a conversion of the chemical structure and the physical state of the material. According to the calculated ratios in the pre-trials, the material was dissolved in water to ensure zero residual remains. For visual purposes, to differentiate the material, a colouring agent was added to each batch. The pre-testing was done on March 29 at the NDDCB laboratory under the supervision of Sri Lanka Police, Police Narcotic Bureau according to the court orders given at the Magistrate courts of Mt. Lavinia and Colombo. The liquefied material was transported for final disposal in specially built hazardous waste transporting vehicle under the supervision of Special Task Force in bulk containers which were GPS enabled with secondary compartments to prevent spillage. At the Cement Kiln co-processing, the material was processed under 1800-2000 centrigrade with a 4-6 second residence time in full controlled parameters of the kiln process. President Maithripala Sirisena inspected the stocks and spoke with officials from the management of INSEE Ecocycle. He was flanked by Inspector General of Police Pujith Jayasundara, Admiral Ravindra Wijegunaratne, high ranking Police,National Dangerous Drugs Control Board and Government Analyst Department officials. The Sri Lankan government yesterday destroyed 769 kilograms of cocaine worth over 10.6 Billion which was confiscated in the year 2016, at a warehouse facility in Kelaniya under open court in the presence of both the Colombo and Mt. Lavinia Magistrates. This is the second time, the government has sanctioned the incineration of narcotics in full view of the public. The first instance was last year in January, when INSEE Ecocycle destroyed more than 900 kilograms of cocaine in similar manner. The cocaine which was diluted yesterday by INSEE Ecocycle at a warehouse facility in Gonawala, Kelaniya were stocks that had completed judicial processes. There were hauls from three court cases before the Colombo Chief Magistrates Court, which included the confiscation of 301.235 kg of cocaine from a warehouse in Orugodawatta in July, the seizure of 31.844 kg from Pettiyagoda in Kelaniya in November and seizure of 219.950 kg by customs officials from a warehouse in Orugodawatta. Police curfew will be imposed island-wide commencing from 10 pm today to 4 am tomorrow, said the Police Media Spokesperson. The entry road to the Bandaranaike International Airport in Katunayake has been opened after inspecting a suspicious car at the airport’s outer car park. Army troops have been deployed in the Mawanella Area following the finding of a suspicious motorcycle .It was reported that the Army had provided security to the Mawanella public market complex. A minor explosion has been reported in a bare-land behind the Pugoda courts. No casualties have been reported said the police media spokesperson Ruwan Gunasekara.